I haven’t seen Mr. and Mrs. Eismann in decades, but as soon as they answer the door I am 10 years old again, coming to play with their daughter Darlene, my childhood best friend. I’ve brought my own mom with me today, and we step inside. I’m here to learn some history of the neighborhood where Darlene and I grew up because Mr. Eismann—Rudy, but I would never call my friend’s parent by a first name!—worked with the builder who developed our subdivision. 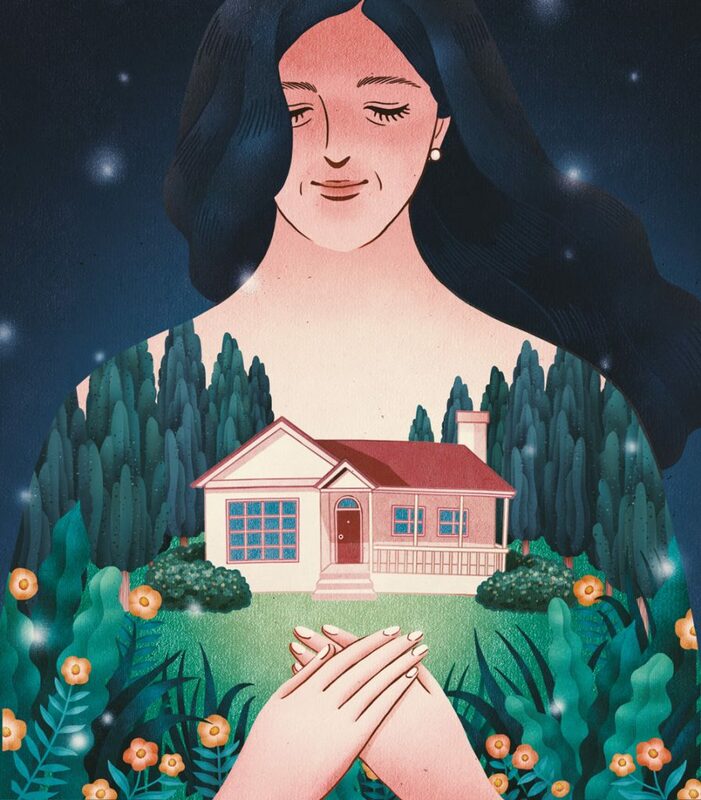 My secret motive is that I want to inspire my mom to think about the next chapter beyond the ranch house I fear is now becoming too much maintenance for an 83-year-old widow. The Eismanns, also now in their eighties, sold their own ranch house and bought this condo in a senior living community almost two years ago. “It’s home now,” Mrs. Eismann—Margaret, if you must—tells me. The gentle lilt of her German accent conjures up memories of pure childhood happiness. They show us around, and I can tell that my mom admires their space. It’s warm and bright, with high ceilings and comfortable furniture. She spies the laundry room tucked right next to the bedroom, and the huge walk-in shower. She comments enthusiastically on such amenities, but I sense she’s not ready to make a change. Mom has lived in her home for 61 years. Its architecture has a hold on her. That relationship we have with the particulars of our space is what I’m writing about, after all—or at least it’s what I told my Cincinnati Magazine editor I’m writing about. It’s why I want to learn about the ubiquity of the ranch design, because I know, even though I’m a Cape Cod girl now, the spirit of the ranch is deep in my soul. Ninety-five percent of the homes Kreutzjans built in my subdivision were ranches. Mr. Eismann, who spent the bulk of his career as a commercial project manager for large buildings at St. Elizabeth’s Hospital and Northern Kentucky University, worked for Kreutzjans from 1957 to 1962. He drew the plans for most of Kreutzjans’s homes (he thinks he drew the plans for ours, but isn’t sure), and he designed and built his own. I ask him why the ranch was so popular on our streets. “It’s what people wanted,” he says. The numbers seem to confirm that. According to architecture professor and critic Witold Rybczynski, by 1950, nine out of 10 new homes built in the U.S. were ranch houses. Still, it was quick work for a style that had started less than 20 years before in San Diego, where architect Cliff May built the first ranch house. May based it on the adobe-style homes that had been in his family. The idea of the ranch was to keep everything on one level, which was revolutionary at the time. With their low, simple lines, ranches represented casual living, with none of the fussiness of turrets and gables. To me, the thought of a ranch house seems as middle-America and boring as it gets—but it was actually inventive. Subversive, almost. It was a statement about building something uniquely American and optimistic for the future. So optimistic that a generation got busy in the bedrooms of ranches all across the country and created a baby boom. Growing up, our own ranch was more boxy than low-slung, and at about 1,500 square feet, on the smaller side. It’s what my parents could afford in 1958. That they could afford to build a home at all was a great surprise to my dad, who found out only after my mom agreed to marry him that she had a small, unexpected inheritance from her grandmother. Though a dining room wasn’t in the budget, my mom did get her wish for a kitchen in the front, so that she could see the children playing in the yard while cooking. While she looked out and saw us enjoying a game of “city” (which involved hanging towels and clothes from trees), the world could look in through the large living room window—a classic feature of ranch houses. It’s where we hung our paper and wax crayon “stained glass” windows at Christmas and the funky plastic skeleton on Halloween. I don’t know about Cliff May’s original intentions, but I can tell you the defining characteristic of our house was proximity. My dad had added space by finishing the basement in the 1960s, carving it into a family room, an extra bedroom, and a second bathroom, but nine people (I was number nine) were still a tight fit. Doors locked and people found patches of privacy, but we all overheard each other’s lives. There was no upstairs to stomp off to, no wing for moping children. You were inside family life all the time. Thankfully, we had a nice-sized backyard. I’ve read that ranches were meant to integrate better with the backyard, to make for a continuous flow of space. But I can tell you that when I went out to play in the backyard, I didn’t want continuous anything. I wanted to be in another world altogether. Naturally, I can’t imagine growing up any other way, not on a street of fancy Tudors, not in a bustling urban area, and not inside some quiet, whispery kind of footprint. But I’ve been having a reckoning lately, where I make myself confront hidden truths about experiences I’ve looked at in just one way. So here goes: The hidden truth of my ranch house and my neighborhood is that it kept us insulated, around people just like us: white, middle-class, and Catholic. Most of the messages I got reinforced this was the “normal” and obvious way to exist. I grew up with the story that my neighborhood was all woods before Nick Kreutzjans started building and that nothing was there. That’s technically true, but very few adults pointed out it originally was native land that had been stolen two centuries before. For every story of love and home, there is an equal hidden story of brutality and displacement. Reckoning is ugly and uncomfortable. On the plus side, though, it makes you really excellent at asking questions you wouldn’t have thought to ask before. You become like a child again, letting loose a string of unfiltered “whys.” So as we’re reminiscing with the Eismanns, it hits me that I don’t know why they came to America. Hundreds of hours I spent in their presence, and it never occurred to me to ask why. All I wanted to do was play Atari with Darlene in her basement or dance to Pat Benatar records with her in my basement. Now it occurs to me to ask. I learn that Mrs. Eismann was actually born here, but her father died when she was an infant, so her German mother took her back to Germany to raise her. A few years after the war, when she was 15, she came back to live with her aunt. She started high school speaking no English. “How did you do that?” I ask, astonished. “It was hard. I studied a lot,” she says casually. I learn that Mr. Eismann was one of nine children and that, toward the end of the war, his family was expelled from their farm in East Germany. They had to leave suddenly on a freezing night in December. They had no gasoline, so had to flee using a horse and wagon. His youngest sister had diphtheria and was in the hospital, and they almost couldn’t find her before they had to leave. They left with nothing, losing the family land, and headed to West Germany, where the children were dispersed to different relatives—but all survived. “I’ve basically been on my own since I was 11,” Mr. Eismann says matter of factly. He came to America at 20 years old, for adventure and opportunity. I’m struck as he tells me this. I had no idea. I try to imagine not only what it would be like to have lived through Nazis taking over my country, but then being forced to leave everything I knew on a bitterly cold night, in a wagon, with eight other people, one of them fragile and contagious. He shares the story easily but does not think it’s extraordinary. He waves his hand to the side, pshaw-like, even as I have about 100 more questions. I know then that the hold my childhood ranch has on me isn’t about its unfussy lines or low-pitched roof. It’s about all of the questions I haven’t asked yet. All of the stories that live in its walls that I don’t know yet. Will I have time to find it all out? To reckon where I need to reckon, and celebrate where I need to celebrate? What did I miss the first time around? How did I live in its tight quarters and let so much slip by? I’ve been thinking that it’s my mom who isn’t ready to sell her house and move on, but the thought of her leaving it creates angst in me too. What will it mean when I can’t go back there? In the car, it’s as if she reads some version of my thoughts. “I really like their space, but I think I would be lost without the house,” she says as we pull out of their condo development. We debrief about how lovely it was to see the Eismanns again, how gracious they were, and how interesting their stories are. Back in Ft. Wright, I ask if she minds if we drive around the block before I take her home. I’m in this neighborhood visiting her every Sunday, but I so rarely pay attention any more. I desperately need to see—to really see—the ranches of Redwood, Hazelwood, and Birchwood again. We pass the Eismanns’ old house, and I stop in front and stare. I try to recall why Darlene and I grew apart. Different sports in high school, followed by different colleges, followed by different circles of people. I should call her, I think. There is rush hour traffic to consider and I’ve got to get home to my tiny Cape Cod in Madeira (1,500 square feet feels a lot more spacious for my family of four), so I drop Mom off in my old driveway. I look upon the orange-red brick, the ash-colored stone I’ve never liked around the front door, and the big front window. I see into our living room and wonder at everything I’ll never know.